hold ’em mission. You read what your assignment will be, then perform it, and finally return to read the follow-up discussion. It’s just that simple. By focusing on only one thing each session, everything miraculously begins to fall into place. One of the most powerful hold ’em training programs of all time! Using a powerful poker training technique, fondly described as the “Mike Caro Method,” you’ll be given assignments to carry out at the poker tables. After you complete each day’s mission, you’ll return to the pages of 12 Days to Hold ’em Success to study the follow-up advice. By concentrating on just one key to mastering hold ’em at a time, you’ll find that everything else is falling into place, just the way Caro says it will. This astonishing short study plan brings winning into focus in just 12 sessions! Printed report style on 28 large pages, this is the highly prized, limited-circulation document that redefined poker training. 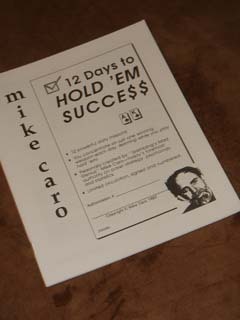 The Mike Caro Method teaches highly profitable hold ’em disciplines the easy way. You complete simple missions. In just 12 sessions, it all falls together and you will have mastered the surprising tools needed to beat hold ’em for life! Far and away the best method for training yourself to accomplish some of hold ’em’s most valuable tactics and never play flawed strategy again. Just 12 sessions at the table and your hold ’em game is magically elevated to fantastic new levels. Rather than covering complex tactics, Mike Caro guides you through the most important keys to long-term hold ’em success. When you’re done, you’ll be able to continually improve your game for life. But that can’t easily happen without these powerful, proven basic missions. For many players, just these 12 carefully chosen sessions by themselves can make the difference between winning and losing.